Frisco is a cozy, mountain town which offers visitors activities all year round. Frisco Adventure Park offers a tubing in the winter and hosts a bike playground in the summer. Frisco Bay Marina is located on scenic Dillon Reservoir and provides boat rentals to visitors. Hotel Frisco is a luxury mountain lodge voted Best Hotel in Summit County for 9 years. The hotel is located within 15 minutes of Silverthorne, Breckenridge, Vail, Arapahoe Basin, Loveland and Copper Mountain ski resorts. There are restaurants, boutiques, galleries, spas, and coffee shops and more. The property features an outdoor hot tub with views of Mount Royal, cable TV, and Internet access. Allow our staff to provide baggage assistance and nightly turn down service during your stay with us. Our lobby is the perfect place to relax and sit by the fire after a long day of exploring the Rocky Mountains. Spend your evenings in the lounge where we feature beer, wine and spirits made in Colorado or reading a book in the hotels private library. Concierge services are available at the front desk. Our rooms are uniquely decorated, clean, and comfortable. We offer premium bedding, with cozy down comforters. Our bathrooms have been recently remodeled featuring granite countertops, tile floors, and luxurious bathroom amenities. Voted "Best Lodging in Summit County" for 2013! 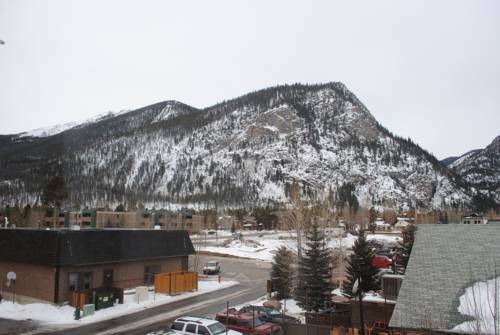 FriscoLocated in the heart of the Colorado Rockies in Summit County, the Hotel Frisco is in the historic city of Frisco. Vail Ski Resort1. Head west on W Main St toward Co Rd 1050/Forest Dr 0.2 mi 2. Turn left to merge onto I-70 W 24.8 mi 3. Take exit 176 toward Vall 0.2 mi 4. Slight right toward Vail Rd 102 ft 5. Take the 1st left 66 ft 6. Take the 1st left toward Vail Rd 69 ft 7. Raven Golf Club at Three Peaks1. Head west on W Main St toward Co Rd 1050/Forest Dr 0.1 mi 2. Turn right to merge onto I-70 E 4.5 mi 3. Take exit 205 for US-6 E/CO-9 N toward Silverthorne/Dillon 0.1 mi 4. Keep left at the fork, follow signs for Colorado 9 N/Silverthorne 194 ft 5.